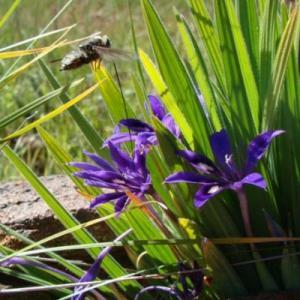 The variety of habitats, soil types and flower species in the Garden and around Nieuwoudtville has resulted in a great diversity of insects, birds and small to medium animals. While visiting the Garden try and spot some of the rare and interesting species in the Garden. 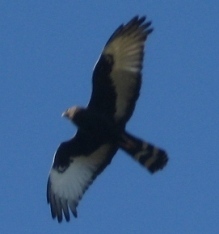 These include the long-tongued flies on the Babianaand Lapeirousia, the elegant and striking Black Harrier (which is the second rarest harrier in the world) and McGregor’s blue butterfly, which has been named for Mr. and Mrs. Gordon MacGregor, the owners of the farm ‘Glenlyon’, now the Hantam NBG, where the species was discovered. With its high density of flowers, the Hantam NBG is a great place to observe pollinators. There are many species of bees, flies, beetles, moths and butterflies, as well as birds and rodents involved in pollination. Many of the fascinating interactions that make the fynbos and succulent karoo regions so unique are found in the Nieuwoudtville area.Some pollinator interactions are best observed after sundown. When the March flowers (Brunsvigia) are blooming in March/April, the stillness just before dark is punctuated by the rapid flurry of wings as hawkmoths flit between flowers. Long-tongued flies are a special feature of the pollination systems in fynbos and renosterveld vegetation where butterflies are often quite scarce. They are associated with flowers that have long corolla tubes such as Babiana, Gladiolus and Lapeirousia. The flies around Nieuwoudtville are mostly tangle-winged flies, with large grey-brown bodies and long tongues (rostrums) that hang down below their heads (in horse-flies the tongue projects forwards). Watch out for them in the dolerite koppies on Lapeirousia oreogena and Babiana praemorsa. Oil collecting bees are interesting pollinators to look out for. Most plants provide bees with a reward of nectar or pollen, but some species provide bees with oil as a reward. The oil glands are usually found in spurs protruding from the back of the flower, giving rise to the Afrikaans common name of horinkies (little horns) for oil producing species of Diascia. Oil-collecting bees have long, hairy front legs that they can insert into the spurs to get the oil. The oil-collecting bees are quite rare but look out for them on members of the snapdragon family (Diascia and Hemimeris) or on moederkappie orchids (Pterygodium). Solitary bees and their beautiful mud turrets that form the entrance to their hives, are also very interesting to observe. Bees pollinate open flowered species, like the water stars (Spiloxene aquatica) and many of the daisies. They are generalist pollinators, though they sometimes acquire a ‘flower search image’ and restrict themselves to that species. 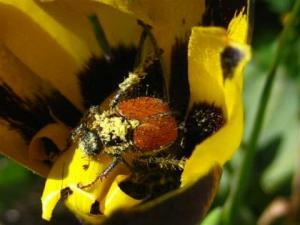 In this way the flowers are not clogged with pollen from other species. These robust beetles, with large hind legs, are usually found in open flowers such as daisies, romuleas, and chincherinchees (Ornithogalum). The beetle larvae live in the soil and scientists have shown that these beetles are associated with specific types of soil. 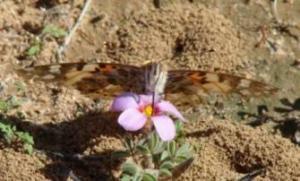 This means that beetles associated with shale soils won’t pollinate flowers that grow on dolerite soils and vice versa. Even flowers that look almost identical, such as Romulea sabulosa (tillite soil) and Romulea monadelpha (dolerite soils) have different beetle pollinators because they grow in different soils. Birds are always an interesting feature of natural and farm environments. The veld around Nieuwoudtville would be strangely quiet without the clapping and whistling call of the clapper lark or the noisy call of the black korhaan.About 152 species of bird have been recorded on the estate so far. Among them are threatened species such as the Blue Crane, the Lesser Kestrel, Ludwig’s Bustard, the Martial Eagle and the near-threatened species of the Black Harrier. Bird pollinators are attracted to brightly coloured red or orange flowers. The birds are usually rewarded with copious amounts of dilute nectar in exchange for the role in the pollination process. 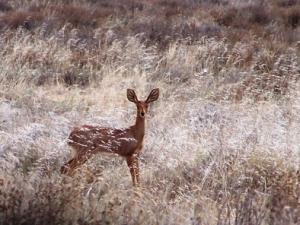 Mammals that occur in the Garden include, amongst others, Cape porcupine, black-backed jackal, chacma baboon, aardvark, steenbok, bat-eared fox and caracal. Small mammals include the Cape rock elephant-shrew, Cape gerbil, Namaqua rock mouse, short-tailed gerbil, Krebs’s fat mouse and the Hairy-footed gerbil.When you walk around you will notice many porcupine diggings. These prickly creatures of the night eat a range of geophyte species, even some known to be poisonous to livestock and humans. For example, they love chincherinchees (Ornithogalum conicum) and tulp (Moraea bifida). Although their activities seem to be destructive, porcupines play an important role in the ecosystem. Many geophytes reproduce vegetatively by cormlets or bulbils and benefit from the foraging activities of porcupines. Their digging sites may even favour plant germination and establishment. Research has shown that more plant seedlings grow in these digging sites. 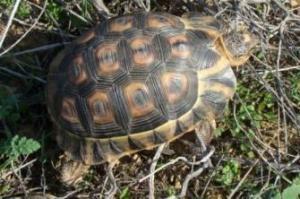 Reptiles in the Garden include the angulate tortoise, Karoo and sand snake, Karoo girdled lizard, southern rock agama, spotted sand lizard, Bribon’s thick-toed gecko and the striped dwarf leaf-toed gecko.